Should I find a spiritual director? I have written before on whether spiritual direction is for everybody, you may read that article [here]. At least this much is clear, all Christians require some level of spiritual direction, even if that is primarily fulfilled through confession. Yet there are certain circumstances which would lead an individual to seek more formal direction: If we are considering religious life or a vocation to the priesthood; if we are a priest or a religious; or if we are experiencing supernatural visions or locutions. There are certainly other cases as well, but these seem to be the most essential times for direction. Our Saint is clear – any who seek to live a life of true devotion must find a spiritual director. Does a parish priest have time to offer direction? Many priests are tempted to think that they do not have time for individual direction. With the priest shortage and the many demands of parish life (especially, in the mega-church model of city parishes) it seems at times that priests really do not have time to give direction – we are even led to wonder whether such priests are receiving direction themselves. “This is a cavilling age, and I foresee that many will say that only Religious and persons living apart are fit to undertake the guidance of souls in such special devout ways; that it requires more time than a Bishop of so important a diocese as mine can spare, and that it must take too much thought from the important duties with which I am charged. “But, dear reader, I reply with S. Denis that the task of leading souls towards perfection appertains above all others to Bishops, and that because their Order is supreme among men, as the Seraphim among Angels, and therefore their leisure cannot be better spent. The ancient Bishops and Fathers of the Primitive Church were, to say the least, as devoted to their duties as we are, yet they did not refuse to undertake the individual guidance of souls which sought their help, as we see by their epistles; thereby imitating the Apostles, who, while reaping the universal world-harvest, yet found time to gather up certain individual sheaves with special and personal affection. Who can fail to remember that Timothy, Titus, Philemon, Onesimus, Phekla, Appia, were the beloved spiritual children of S. Paul, as S. Mark and S. Petronilla were of S. Peter (for Baronius and Galonius have given learned and absolute proof that S. Petronilla was not his carnal but spiritual daughter). And is not one of S. John’s Canonical Epistles addressed to the ‘elect lady’ whom he loved in the faith? “I grant that the guidance of individual souls is a labour, but it is a labour full of consolation, even as that of harvesters and grape-gatherers, who are never so well pleased as when most heavily laden. It is a labour which refreshes and invigorates the heart by the comfort which it brings to those who bear it; as is said to be the case with those who carry bundles of cinnamon in Arabia Felix. It is said that when the tigress finds one of her young left behind by the hunter in order to delay her while he carries off the rest of her cubs, she takes it up, however big, without seeming over-weighted, and speeds only the more swiftly to her lair, maternal love lightening the load. How much more readily will the heart of a spiritual father bear the burden of a soul he finds craving after perfection carrying it in his bosom as a mother her babe, without feeling weary of the precious burden? Yes, if St. Peter and St. Paul and the other apostles were able to find the time to serve as directors for individual souls, how much more must the parish priest (whose calling is not nearly so demanding as that of the apostles) make time for spiritual direction! 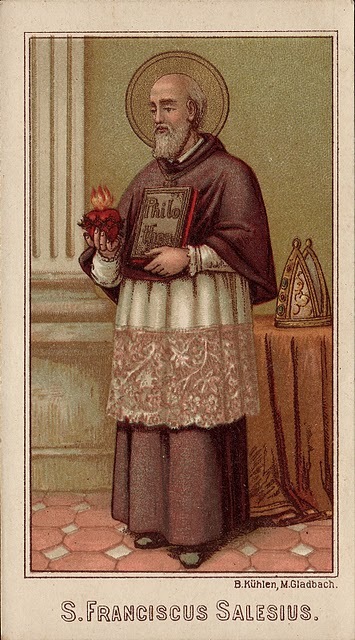 What is particularly telling is that St. Francis de Sales sees spiritual direction as part of the refreshment of the priest – it is a labor which brings him true recreation. In this, we are reminded of our Savior who, when he was hungry and thirsty, did not fail to offer personal direction to the Samaritan woman at the well of Jacob – and it was in this service that our Lord received the food of which the apostles did not yet know. So too must the parish priest find his spiritual food and nourishment in the individual direction of souls, both through formal spiritual direction and through the sacrament of penance. But it will not be enough for a priest simply to make time for direction, he must educate himself to learn how to be a good director. Indeed, poor direction is far worse than no direction – especially for the priest offering the poor guidance! Giving bad spiritual direction (or bad advice in the confessional) is a path for a priest to lose his soul, and also to damn the souls of his sheep. No, simply making time to give direction will not be enough, the parish priest must take time to study – he already ought to be making time for prayer. And what should he study? What sorts of resources should the parish priest look to in order to become a good director of souls? Simply relying on contemporary works (even if they are orthodox) will not be enough – the works of Fr. Thomas Dubay (for example) are a good start, but they are by no means sufficient. It goes without saying that a priest must be familiar with Scripture and the teachings of the Church. Further, he must be an expert in Christian anthropology – and this is a point upon which St. Teresa of Avila insists: Most early errors in the spiritual life arise from a poor understanding of the nature of the soul. Put simply (by way of example), if a priest cannot clearly recognize and explain the categorical difference between the gifts of the Holy Spirit and the infused virtues, he has no business serving as a director of souls. And to this, a hundred other points could be added. If he does not know what distinguishes a charism from a fruit of the Holy Spirit, or if he does not know how the acquired virtues relate to the infused virtues, he is not prepared to serve as a director of souls. Let the priest be familiar with the sections on morals and on prayer in the Catechism, as well as St. Thomas’ Summa Theologica I-II and II-II. He would do well to read Fr. Garrigou-Lagrange’s “Three Ages of the Interior Life” (a two volume work of over one thousand pages – and if this seems too long, he can be sure that he has not the love and devotion requisite of a director). He should consider reading the “Dignity and Duties of the Priest” by St. Alphonsus Liguori. Beyond this, a spiritual director must read the classics of Catholic spirituality. Of the modern works, we point especially to “The Introduction to the Devout Life” of St. Francis de Sales, “The Interior Castle” of St. Teresa of Avila, “The Dark Night” by St. John of the Cross, “The Imitation of Christ” by Thomas a’ Kempis, and other such works (especially, “The Spiritual Combat” by Lorenzo Scupoli). From the more ancient tradition, we point to St. Athanasius’ “Life of St. Anthony”, St. Augustine’s “Confessions”, John Cassian’s “Conferences” (which St. Thomas Aquinas carried with him at all times), St. Benedict’s “Rule”, and St. Gregory of Nyssa’s “Life of Moses”. Of course, many other works could be joined to these – especially from the great medieval authors. A priest, in order to serve as a spiritual director without putting his own soul and the souls of his sheep in grave peril, must be an expert in the spiritual life. He must dedicate time every day to the study of moral and spiritual theology, resisting the modern “fads” (even if they be orthodox) and preferring instead the classical works and especially the writings of Church Doctors. If a priest has not yet read the works of St. Alphonsus, he has no business reading Fr. Dubay (even though Fr. Dubay is good and orthodox, he is no Doctor of the Universal Church). If he is not intimately familiar with Sts. Francis de Sales and Teresa of Avila, how can he justify reading contemporary authors? As good as “Spiritual Combat Revisited” by Fr. Jonathon Robinson of the Oratory is, the director of souls is ought to read the original “Spiritual Combat” of Scupoli with greater attention. What if I cannot find a good director? Yet, it may sadly happen that a devout soul cannot find a good director – indeed, good directors are most rare. If such occurs, I would refer to a previous article on what to do when you cannot find a spiritual director [here]. Indeed, it would be better to have no director at all than to have a bad director. Should lay people serve as spiritual directors? 1) Priests ordinarily go to seminary school for eight years (or at least four years). The formation is academic (intellectual), spiritual, pastoral, and also human. This formation is almost continuous (literally, nearly 24 hours a day 7 days a week) for the whole eight years. And, even after all that training, very few priests are truly capable confessors or directors. Does anybody really think that a three to four year program (which is not even live-in) suffices for training lay people as spiritual directors? 2) After this intense eight year seminary formation, newly ordained priests work with a more experienced priest for usually at least two years. Again, this is a 24/7 formation, as they live with the priest and receive constant guidance. Is there anything like this for lay spiritual directors? No. 3) The priest's whole life is dedicated to his people (or at least it ought to be) – he has no family, no other work, no other obligations. But all he does is for the flock. Even with that, many priests still find it difficult to dedicate the time needed for direction (since prayer for the people outside of actual meeting time is very important). How can we expect lay people, who have jobs and (perhaps) families, to be truly dedicated and serve as directors of souls? Are there exceptions? Certainly! Are there lay people who are holier than priests? Many (perhaps most)! Are there even lay people who are more educated in the spiritual life than priests? Some. For my part, I can hardly think of a single situation in which I would recommend a lay person to go to another lay person for formal spiritual direction (and I would never recommend a priest or religious to take a lay person as a spiritual director). Nuns and monks serving as directors is, of course, a different story all together. Though, personally, I would consider the case of permanent deacons to be pretty much the same as that with lay directors – rarely would a permanent deacon be capable of serving as a director. Does it not depend on what you mean by spiritual direction? As a priest and director myself with an extensive clientele, I see the role not as direction in the sense of telling people what to do or what they should believe, but on helping them to see where God is working in their lives, what he may be saying to them, how they can grow in knowledge of God. It need not, more often than not does not address particular issues of discernment, but tends to be mostly concerned with people's ongoing life of faith. It is not a specifically priestly (ordained) ministry at all, and there are far more skilled lay directors than ordained. In London, where I live, there are two well-established courses of training for directors, based on the Ignatian tradition and carried on to high professional standards. (Seminary training may be longer, but is hardly comparable). These courses, as it happens, are not run by the Catholic Church, but do have Catholic tutors and students. Where the focus is primarily on God, rather than being this or that sort of Christian, denominational differences tend to fade into the background. Responsible directors will usually have regular supervision as well as directors of their own and tend to be the sort of people who take part in regular in-service training. I do not think that everybody needs or would benefit from spiritual direction, but those who use it always seem to value it highly. Those who try it and give up quickly are usually people who want quick definite answers in areas of life and faith where such things are not available. Finally, my experience is that spiritual direction is an excellent contemporary way of helping people to make a 'confession' (in a broad sense) and know God's love for them when they have given up the practice of sacramental confession because it had become too much of a sterile routine and the Church had not done much to help them use it in a more mature, truthful way. The closest parish to us has 1 elderly priest with health issues, 1500 families, and no deacons (yet). Some parishes don't have priests at all. If that elderly priest sees just one person per family per year, he'd be spending his time on 5 parishoners per day excluding Sundays. Even if he can carve an extra 5 hours per day outside of homily prep, meetings, RCIA inquiries, marriages, funerals, baptisms, and hospital/anointing visits, is an hour per year of spiritual direction enough for someone? And what if someone else in the family wants to talk to Father, too? Spiritual direction is a charism that I'm not sure is reserved for priests. I have had some priests who were not gifted, either. A cadre of orthodox sisters and wise older deacons would at least be able to direct needy parishoners to the right spiritual reads. Lumen Gentium has beautiful language for the responsibility of all the people of God. While we're praying for vocations, laymen can lead Bible studies, Christian book clubs, serve as Christian counselors, theologians, and have people over for tea -- within the parameters of Catholic orthodoxy. Abusus non tollit usum. Our priests *are* too busy except in blessed and rare exceptions. I'm grateful for the internet priests and deacons who post their thoughts. The internet might be an impersonal medium, but it's another efficient way to get spiritual direction from a priest who does have the time and the gifts of spiritual direction. You wrote: "Spiritual direction is an excellent contemporary way of helping people to make a 'confession' (in a broad sense) ... when they have given up the practice of sacramental confession." That single line is an excellent proof that these "training programs" (which you claim to prepare lay persons to be good directors, but are not even under the direction of the pastors of the Church) are very inadequate. If you are giving direction to people who are not going to sacramental confession, and if you are offering your directive "services" as another option apart from sacramental confession, then you are putting both yourself and them in grave danger. Further, the fact that you claim the spiritual direction programs to be helpful when they are only (perhaps moderately) familiar with one particular spiritual tradition (that of St. Ignatius) is very troubling. Sts. Peter and Paul had the whole world to convert ... and they still found time to offer individual spiritual direction. The fact is that not all 1500 families will be looking for direction - nor would all of them benefit from direction at every point in their lives. You said: "Our priests *are* too busy except in blessed and rare exceptions." Please give a citation from a Doctor of the Church to back that up. St. Francis de Sales (as well as St. Alphonsus Liguori) says just the opposite. Priest not only need to make time for direction, they also need to make time to study the classical works of the Catholic tradition. 5 hours a day would not be too much to ask (between study and direction and confession). Priests are not too busy ... it is their duty to offer spiritual direction ... indeed, their salvation will often depend upon taking time for study and for offering direction. Thank you for this. I'm very blessed to have found a good spiritual director several years ago. I shall pass this on to several of my friends, both priests and laymen. As a parish priest I can testify that there are few people in parishes who are ready or committed enough to a life of prayer to receive spiritual direction. I think the first step is for people to confession to the same priest regularly (once a month or more). I find that for the average parishioner this is more than enough spiritual direction for their state in life. Is it possible that St. Francis DeSales was wrong on this particular topic, or was not thinking of our modern situation? Also, on a different note, why do you always think everything has to be backed up by the Doctors of the Church? You seem to rely excessively upon them. They are not infallible, and have make theological mistakes. We also must take into account that they were writing in times very different from ours. I'm not saying they are not valuable, for they surely are, but merely that we should be open to other sources as well. I agree with you that few people will either be inclined or ready for individual spiritual direction ... indeed, as you say, if we could get confession to be more popular, that would be a great thing! Could Francis de Sales be wrong on this issue? Perhaps. But since it is not just de Sales, but also Alphonsus, and Teresa, and Ignatius, and so many others ... no, I do not think that they could all be wrong. Priests need to make time for direction ... and they need to make time to study well so that they can be good confessors and directors. Regarding my reliance on the Doctors of the Church ... in matters of prudence and of the intricacies of the spiritual life, questions are so difficult and the matter so important for salvation that I cannot even imagine relying on anyone more than (or equal with) the Doctors and Fathers of the Church. You will notice, however, that I recommended Fr. Garrigou-Lagrange ... he is not a Church Doctor, but I still trust him as a good guide -- since, he constantly recommends the Doctors. You will also notice that I cited Pope Benedict XVI at the beginning of the article. Further, if you ever read (or have read) much of St. Alphonsus, you will notice that most of his books are citations from the Fathers and Doctors of the Church -- I should think that, if St. Alphonsus insisted on following the Doctors of the Church, I would be very prideful to take a different path. Paul planted churches and went on to the next, appointing leaders there. He advised the Christians there in bulk, not individually, and not all that frequently, as history is able to tell us. It would be disrespectful and presumptuous of me to demand our priest do more of anything than he already does. We are grateful to have our holy priests and do what we can to help them. I'm surprised that you would be able to know how busy our priests here are, or that they are not already giving time from their poverty rather than their wealth of hours (Lk 21:1-4). Their own spiritual directors, who know them, would seem to be more informed to make the call. Sts. Peter and Paul (as well as John) did serve as directors for individual souls ... please look again at the quote in the article from St. Francis de Sales. Regarding who is capable of telling priests what to do ... it is not me who says it, but de Sales and the other Church Doctors. Thank you for this excellent reminder! As a sinner who am, I hope, repentant, and an ardent Scrupolitan, Father, I have a sense of blessed security with your virtuous, fatherly guidance. As a parishioner and directee, I promise to study, pray and live my life as proposed by the Church in the Bible, the Catechism, the Fathers, the Papal and Council documents, etc, and according to the guidance of my confessor and spiritual director, through the power of the Holy Spirit. In sum, to pray and work for the glory of God in my daily life. God bless you and your confreres for taking the time out of your busy schedule to offer this blog for our information and guidance, Father. Thank you for your commentary in this field, especially for your reliance on the Doctors and auctores probati. There is no safer path in moral theology (or any theological field for that matter) than to go to the Magisterium, the Scriptures the Fathers and Doctors and the approved authors. Also, the above (especially the Magisterium and Scripture) are best taken from the perspective of our saintly and learned Fathers and Doctors as well as by those approved authors which have a legitimate weight behind their writing (i.e. Garrigou-Lagrange). Personally, I find few things more dangerous in the life of the Church than modern authors, well meaning though they may be, departing from this well trod path in their effort to reinvent the wheel. While it is especially evident in dogmatic theology, it is certainly to be seen in the spiritual theology field as well. Appeals to "modern conditions" only go so far. While some prudential or practical advice might no longer be applicable, it seems to me that when this occurs it is rather obvious and the appropriate time conditioned response can be substituted. Any criticism of the Doctors' et al. "outmoded" or "obsolete" theology can pretty much be dismissed as Modernistic and smacking of the nouvelle theologie. Also, while I agree in principle with your comments on who should be spiritual directors, I take issue with it in that even priests are not necessarily equipped for it any more. I was in the seminary for a spell, and unless you had an a good director yourself, did plenty of your own reading on the side and ignored all the various departures from traditional spirituality you encounter (like at a certain summer program in a midwestern state where most seminarians will go to at some point in their studies...) you will be very ill prepared. I concur. Most priests are not able to serve effectively as spiritual directors. And IPF most certainly does not prepare them according to the Catholic tradition of spiritual theology. Working with an accredited spiritual director has been a tremendous part of my priesthood. Any priest can call himself a spiritual director, but few have the training. Unless things have radically changed in the seminary lately -- and with the episcopal emphasis on the vital importance of theology I doubt that very much -- seminary study only brushes upon the great classics of the spiritual life and spiritual direction. Simply attending a seminary doesn't make a priest a spiritual director any more than simply attending church makes one a true Christian. First time I've seen your blog Father and glad to see this post. My two cents is, I wish more priests would more often start by at least relating more to the catechism in their homilies. Much of the homilies I have ever heard in my 40+ years are all really very similar, and really could be summed in a Norman Vincent Peale booklet. But even an occasional sitation from the catechsim would go a long way towards counseling the flock. Hey Anonymous: I do not find that so here in Florida. When they were relating that Cat stuff you weren't listening or were half awake. Or most people who are about late 20s and early to mid 30 s were all out partying and raving. The church has been preaching the gospel, the only thing is this: many were not listening and because of this incompetence and lack of listening they blame the church. Time to duck people we 40 somethings are on to your little hide and seek game. We were the ones who babysat you fools. In speaking of "confession" in a broad sense I hoped to indicate that I was not speaking of sacramental confession. None of the properly (and rigorously) trained spiritual directors I am familiar with would confuse the two. There is no danger at all. People in direction might indeed be encouraged to return to the practice of confession in a renewed and more meaningful way. I have often found this to be so. Training courses that come out of an Ignatian background and draw on the Spiritual Exercises would always recognise the value of other ways and never impose any one way. The emphasis is on open mutual listening to God. There is no need to be troubled here either. If you were prepared to accept that the working of God is not confined to the Catholic sacramental system, you might be surprised to discover that an Anglican laywoman might well be close to God and able to help others - even perhaps yourself - draw closer to him as well. I think that you might be overreacting a little bit ... the fact is that many priests were not preaching the truth, especially during the 60s, 70s and 80s. Even today there are still priests who give almost no solid Catholic teaching in their homilies. Thankfully, the situation is getting better ... apparently, from what you say, Florida is well ahead of the rest of the world. If your "training courses" emphasize ignoring the real differences between Catholics and protestants -- especially in terms of morality, prayer, and the life of grace (which is where the differences are most grave) -- then they are NOT in the true Ignatian tradition. The Jesuit spiritual tradition is specifically counter-reformation in character ... as opposed, for example, to the Dominican tradition which came before all the protestant polemics. I cannot see how there can be true spiritual direction with non-Catholics ... if they are not living the sacramental life, then they are not ready for true direction. Certainly, conversation and dialog, but not spiritual direction. My advice to you, father: Set aside the nonsense that these "training courses" have given you, go back to the classic works. Based on what you have said in comments, I could not recommend anyone to go to spiritual direction with you. More and more people are seeking spiritual direction in their desire to deepen their relationship w/our Lord and get the help along the way to make it to heaven, but few are those blessed w/a good spiritual director. SD is really a gift, one that some priests have and some don't. We need to pray for more vocations so we can have more priests to minister to us lay people. After reading st francis de sales book it was clear to me that only w/spiritual direction would i advance in my spiritual life. Father, every time I start to forget the many problems we have in the Church as a result of the past forty plus years of neglect, reading some of the comments here always reminds me. And it never, ever ceases to astound me that some actually think that they know better today than the true Catholic experts of the past. A quick look around the Church will show where all the new-fangled nonsense got us. I do agree, ideally we should have priests as spiritual directors but we really need to start doing a better job of training them in that field. Spending time at Clear Creek and at the FSSP and ICRSS parishes taught me more on this point than anything else. Combine that with the fuzzy theology they get back at the seminary (even if it has been toned down from Rahner and Schillebeecx to von Balthasar and Congar) and I see a train wreck. Lord preserve us! and I trust He will on His timeframe.